My friend Eric has family from St. Louis and he would always tell me how wonderful the Provel cheese they put on their pizzas was, used especially at Imo's Pizza. One day when I was in our grocery store (Schnuck's on Union for you locals) I saw Imo's pizza sauce and figured I might try it out. Well, later that same trip, lo-and-behold (love that phrase! ), guess what kind of cheese Schnuck's sells in the deli? Provel! 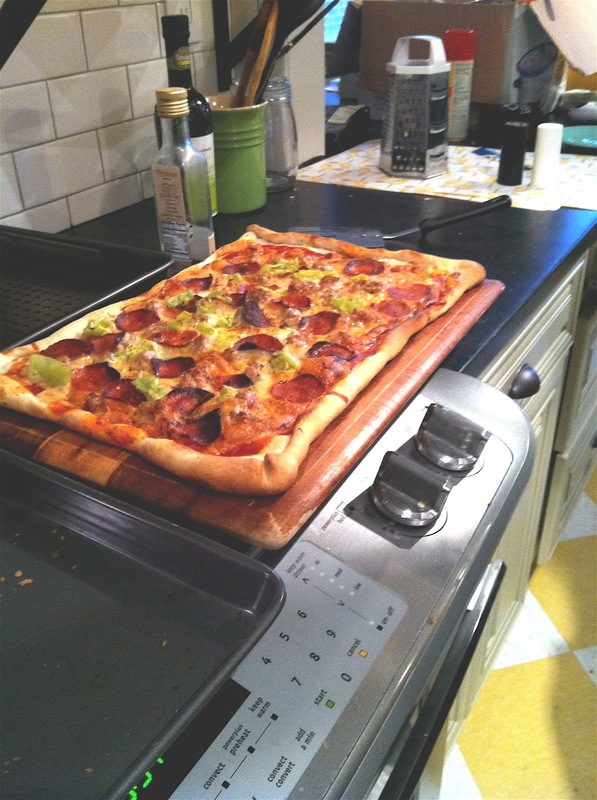 We bought a small block of it and headed home to make a St. Louis inspired pizza. Now real St. Louis pizza would have a thin, flaky crust but around here, we use the canned stuff (it happens). But, nonetheless, St. Louis inspired. We shredded the Provel, laid out the crust, added the sauce, put the cheese on, and then added pepperonis, sausage, and pepperoncinis. One thing we did different this time with the pepperonis that I really liked was we threw them in the skillet with the sausage just a minute to make them crispy prior to cooking the pizza. Provel has a very different taste to it - it is smooth, goopey, and a bit smokey. I loved it. I'm still going to use fresh mozz usually but for something different, I'm definitely going to turn to Provel cheese. Yes that pizza looks really good! I love seeing your new kitchen in the background of your food pictures. It must be so much fun cooking in it! Yay!